Osteomas are benign, slow-growing tumors found commonly in craniomaxillofacial region. Clinically, they may remain asymptomatic because of their small size or may become symptomatic because of enlargement, erosion, or compression of structures in the vicinity. Treatment is needed in frontal sinus osteomas causing symptoms or having immediate potential to cause complications. The treatment approach can be closed or open depending on the size, location, and frontal recess area occupied by the tumor. We present two cases of frontal sinus osteoma with varied presentations at the two ends of clinical spectrum and discuss the management protocols. Osteomas are benign in nature and are the most common tumors of cranial vault and facial skeleton. They are unusual but not rare. Most of them remain asymptomatic and hence occult, getting diagnosed incidentally. The incidence of osteomas is 0.014%–0.43% in the general population. Clinically, there are two groups: the first group belongs to the accidentally diagnosed symptomless osteomas and the second group belongs to those causing symptoms. The management differs in both the groups. We present two different cases belonging to each of the categories and discuss their management in detail. A 60-year-old woman with an unremarkable medical history presented to the ENT clinic with frontal headache, more on the right side. Anterior rhinoscopy did not reveal any abnormality. Eye vision was aptly corrected with the requisite power glasses. Computed tomographic (CT) scans revealed large osteoma involving the right frontal sinus attached to its posterior wall. An osteoplastic flap repair was done without obliterating the sinus. The patient got relieved of the headache and is keeping well 2 years postoperatively [Figure 1]. Figure 1: (a) Computed tomography showing large osteoma in the right frontal sinus, (b) bicoronal incision, (c) boundaries of frontal sinus marked using template of frontal sinus repaired from a preoperative anteroposterior radiograph taken at 6 feet of distance – Caldwell's view, (d) osteoma arising from the posterior wall of frontal sinus visualized after raising osteoplastic flap, (e) flap reposited and stitched back, (f) frontal glow seen on showing light from the right nasal cavity. A 21-year-old male presented to the ENT OPD with complaints of nasal obstruction. Anterior rhinoscopy revealed a deviated nasal septum. He had got a CT done outside which showed a small osteoma in the left frontal sinus [Figure 2]. Septoplasty was done under local anesthesia and the patient is asymptomatic since then. Figure 2: (a) X-ray paranasal sinuses showing osteoma in the left frontal sinus with the left bony spur, (b) computed tomography showing small osteoma in the left frontal sinus. The pathogenesis of osteomas is unknown. Few physicians consider it a true neoplasm, some a developmental anomaly, and yet others suggest them as a consequence of reactive mechanism, triggered by trauma or infection. Histologically, osteomas comprise peripheral cortical bone with underlying cancellous tissue and central fibrovascular stroma containing blood vessels. It is theorized that growth starts centrally and proceeds peripherally with increasing bone maturation externally. CT is the imaging modality of choice for osteomas. Chiu et al. proposed a grading system of osteomas on the basis of three parameters: size of osteoma in relation to size of frontal sinus, point of attachment, and location of the lesion in relation to a virtual sagittal plane passing though lamina papyracea (LP). Grade I frontal osteoma is the one located medial to virtual plane through LP with base attached to posteroinferior part of frontal recess and anteroposterior diameter of osteoma being <75% of the anteroposterior frontal sinus diameter. Grade II has similar features as above, except that its anteroposterior dimension is >75% of frontal recess. Grade III osteomas lie lateral to the virtual plane passing through LP or have their attachment either anteriorly or superiorly. Grade IV osteomas are massive in size and fill the entire frontal sinus. This classification can be considered while deciding upon the surgical route. First case of ours belonged to grade III category in accordance with this classification. The surgical modes of removing frontal sinus osteoma are closed endoscopic approach and open osteoplastic flap or lynch frontoethmoidectomy. With the advent of endoscopes, closed approach has become more popular, but cases where osteomas are too huge for frontal recess or lie too lateral in the frontal sinus pose difficulty in their endoscopic removal and necessitate the use of open procedure. Grade III and Grade IV are the frontal osteomas that would require combined use of endoscopes and open methods such as osteoplastic flap operation to be removed completely. In this surgery, the scar gets easily camouflaged behind the hairline. Frontal sinus obliteration can be given a thought depending on the status of lining mucosa. Titanium mesh can be used for frontal contouring when the anterior wall of the sinus is removed because of extensive involvement. We also operated our first case with osteoplastic flap surgery. It has additional benefit in posteriorly arising osteomas where there are chances of dural tear on attempting complete tumor removal in a tunneled way. Osteomas may pose management dilemmas for otolaryngologists. Only symptomatic osteomas should be considered for surgery. Although endoscopic treatment is the most common approach for frontal osteomas, a coronal osteoplastic flap approach still constitutes a valuable option for large and frontal recess occupying osteomas. Patel TR, Borah GL. Frontal bone periosteal osteomas. Plast Reconstr Surg 2004;114:648-51. Earwaker J. Paranasal sinus osteomas: A review of 46 cases. Skeletal Radiol 1993;22:417-23. Koivunen P, Löppönen H, Fors AP, Jokinen K. The growth rate of osteomas of the paranasal sinuses. Clin Otolaryngol Allied Sci 1997;22:111-4. Brunori A, de Santis S, Bruni P, Delitala A, Giuffre R, Chiappetta F, et al. Life threatening intracranial complications of frontal sinus osteomas: Report of two cases. Acta Neurochir (Wien) 1996;138:1426-30. Exley RP, Markey A, Rutherford S, Bhalla RK. 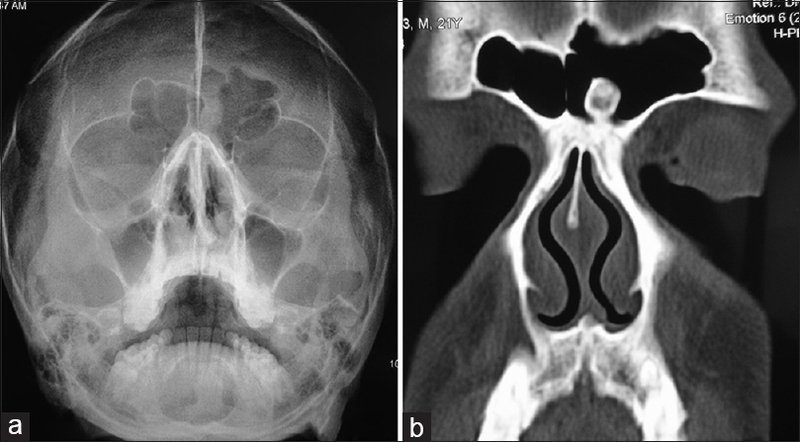 Rare giant frontal sinus osteoma mimicking fibrous dysplasia. J Laryngol Otol 2015;129:283-7. Sayan NB, Uçok C, Karasu HA, Günhan O. Peripheral osteoma of the oral and maxillofacial region: A study of 35 new cases. J Oral Maxillofac Surg 2002;60:1299-301. Chiu AG, Schipor I, Cohen NA, Kennedy DW, Palmer JN. Surgical decisions in the management of frontal sinus osteomas. Am J Rhinol 2005;19:191-7. 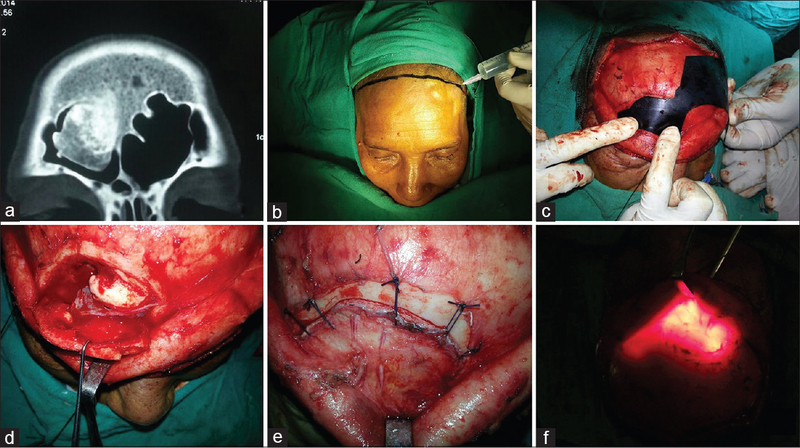 Boffano P, Zavattero E, Roccia F, Ramieri G. Open surgical management of an asymptomatic giant frontal sinus osteoma. Craniomaxillofac Trauma Reconstr 2014;7:51-4.